Houseplants are like pets - they rely on you for their health and happiness. 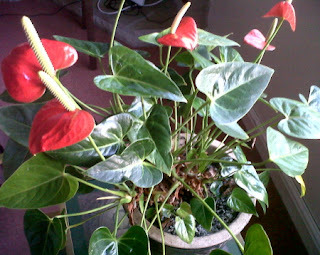 A happy plant will give you joy for years with lovely foliage and flowers - something to interest and often surprise you. The biggest mistake with houseplant care is over-watering. Nearly all houseplants only require to be damp - not wet. Wet roots kills more plants - indoors and outdoors - than being dry. Generally, keep a schedule of once-a-week watering - or indeed just checking the dampness. In some cases - orchids and cactuses especially - you can leave them a couple of weeks with no ill effects. Streptocarpuses are really awkward. They need to be kept damp or their leaves will flop. But equally if over-watered they will flop too. You need to check the dampness of the soil and see if there's any standing water in the tray or dish below the pot. If the pot is in a decorative pot with high sides it's not easy to see the water level and you keep topping up and gradually drowning the poor plant. Orchids need hardly any water. They have aerial roots that get water from the air and don't rely on their normal roots for water. We have all kinds of plants in the house, but they are really out-door plants. Some live in hot, dry places, others hot and damp. Generally we keep them indoors because it's too cold in England for them to be outdoors. To get the best from them you need to give them an environment as much as possible like their native situation. So African violets (Saintpaulias) which live on forest floors like indirect light - a north or east-facing windowsill is ideal. They really don't like direct sunlight. Good idea to turn them once a week so they don't grow lop-sided. Ferns and lilies are happy away from a window. Even Florida Palms manage in the shade. Spider plants and cactuses like the sunshine. You've created a lovely atmosphere for your plants and bugs will love it too! Little white specks are aphid babies. Wipe them off before they can get big. Greenfly can devastate the growing tips of plants. Watch out for them and squish them or spray them with dilute washing-up liquid and wipe them off. Some plants with shiny leaves are tempting to scale insects. They appear first as brown specks and you might notice sticky substance on leaves and on the table around the pot. The sticky stuff is scale insect excretions and it often becomes black when moulds grow on the sugars it contains. There are bug-killer solutions out there but I do this: Mix a very weak solution of washing up liquid and wipe the leaves with a soft cloth or kitchen roll every week when you water the plant. Wipe the top and underneath of the leaves and also the stems. Useful to have the solution in a spray and then you can give the whole plant a dowsing. It’s a bit of a chore but does reduce them over a while. I've recently tried Bug Clear Ultra which is a systemic insecticide and seems to kill them off. Lemon trees and oleanders are prone to scale insect too. They seem to benefit from putting outdoors in the late spring to autumn. The cooler weather can help to kill off the bugs.